North Sinai witnessed on Wednesday the largest terrorist attack of its kind by Islamic State (IS) militants against Egyptian security forces in less than nine months. On the eve of the second anniversary of the ouster of Islamist President Mohamed Morsi, battles between Islamist militants and the Egyptian army in northern Sinai left at least 117 people dead - 17 army soldiers and 100 militants - according to the latest statement by the armed forces. The attacks, which revolved around the North Sinai cities of Sheikh Zuweid and Rafah, come a day after the Egyptian president Abdel Fattah El-Sisi vowed to issue and amend stricter laws against militants following the assassination of the country's top prosecutor Hisham Barakat on Monday. And for the third year in a row, Islamist militants target security forces on a large scale during the Islamic holy month of Ramadan. Reports from Sinai on Wednesday evening had indicated that the atmosphere on the ground had relatively cooled down compared to a raucous bloody morning, as the army managed to fend off a massive militant attack on multiple checkpoints and police stations before finally breaking an hours-long IS siege of the city of Sheikh Zuweid to regain control. Still, eyewitnesses told Ahram that Egyptian army Apache helicopter airstrikes continued to target Islamist militants' hideouts in the city. Those witnesses also said power outage in the area left the city dark. Back in Cairo, the National Defence Council held an emergency meeting to assess current political and military developments in the aftermath of both the assassination of the prosecutor general on Monday and IS assaults on army positions in Sinai. Hours after the deadly attack started, the Egyptian cabinet approved stricter laws aimed at countering a new wave of terrorism. According to a statement issued later in the evening by the General Command of the Armed Forces, the militant attacks started by “terrorist group” at 6:55am. Militants launched simultaneous attacks on a number of armed forces checkpoints in Sheikh Zuweid and Rafah using car bombs and various weaponry, the general command said. The statement said that the army killed more than 100 militants during its counter-attack operations. It also highlighted that 17 army personnel including four officers were killed in the fighting, and 13 others were injured. Earlier in the day, Islamic State-affiliated Sinai Province militant group, previously known as Ansar Beit Al-Maqdis, issued a statement on social media claiming responsibility for all the attacks, highlighting that its allies had mounted 15 simultaneous attacks on military sites in Sinai. The IS statement said the group attacked 11 checkpoints and a police station in Sheikh Zuweid using missiles, adding that it laid siege to the town's police station, destroyed two military tanks and attacked four checkpoints using mortar rounds. Wednesday's face-to-face fight between the militants and the army lasted around 16 hours, thus becoming the longest battle to day between the two sides. In the middle of the afternoon, army spokesman also announced that the two main terrorist bases have been destroyed and air force jets continued to bomb other sites. By nighttime, the Egyptian army had reportedly used F16 jet fighters, Apache helicopters and tanks to stop the militants. Major General Hisham El-Halaby, who teaches at the National Defence College had told Ahram Online that the perpetrators — whom he described as highly organised and trained — sought to deliver several messages through this attack, whether in terms of its timing or organisation, or the scale of the deployment of their elements. "Those 70 who attacked the forces in Sheikh Zuweid represented the first wave of attackers. The total number of attackers throughout the day might exceed 300 elements or even more. This is a new technique that the militants have been using in their operations," El-Halaby explained. The military expert pointed out that the weapons used in Wednesday’s attack are usually owned by armies not other armed groups operating in the Nile Valley or Delta region, citing the Sinai-based militants' use in Wednesday's operations of anti-aircraft guns and C4 explosives which are "ten times powerful than TNT explosives." The assassination of Egypt's top prosecutor and Wednesday's confrontation in the Siani peninsula between the Egyptian army and the IS affiliated group could be signs of a new level of field combat between the two camps, several commentators said.
" We control the situation in Sinai 100 percent," he added. there is no limit to the stupidity of IS. how can they fight the great army of Egypt and ninety million Egyptian lions ready to eat their enemy alive!. Egypt has full right to defend itself. However when Israel defends itself it is considered a crime. 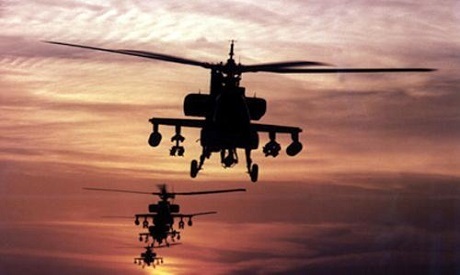 I think Egypt should keep up its offensive against the Sinai terrorists until they kill or capture all the nests. Foreign think tanks have estimated the terrorists as about 2,500 which is the number Egypt should 1) confirm and if correct 2) not stop till they get them all. Great Egyptian Army! God bless you! After today, it is time for Egypt to officially declare war on these groups and their sponsors. If these groups get aid from foreign intelligence services then Egypt must declare all out war on these nations. Egypt has the biggest army in the region. It is time that it put it to use. Egypt is being walked on and disrespected to a great degree for the last few years. Now is the time to make it clear to the world that Egypt will not stand for this. When the enemies of Egypt slap it, Egypt shouldn't turn the other cheek. It should slap its enemies back and take their teeth with it. Egypt needs to fully use its military force throughout the region and make a point to its enemies that attacking Egypt comes with a dear cost. If that means airstrikes on other countries or full out invasions, then so be it. How many times does Egypt have to be attacked before it uses its full might against its enemies? I hope we expedite the trial of Morsi and issue a verdict as double agent. Did we broke the siege of our young police officers in rafah? Are we guarding the destroyed Raqfah crossing?